Markings: The left side of the slide is marked “D.G.F.M. – (F.M.A.P.). The right side of the slide is marked the Argentine crest, “EJERCITO ARGENTINO / SIST. COLT CAL. 11.25mm. MOD. 1927” and “76284”. The top of the slide behind the ejection port, top of the chamber, right of the frame, grip frame under the mainspring housing and the magazine floorplate are also marked “76284”. Sights / Optics: The pistol is mounted with a “U” notched rear sight dovetailed into the slide and a short rounded blade front sight fixed to the slide. Stock Configuration & Condition: The grips are checkered black plastic. The right panel has raised circles around the grip screws while the left has recessed circles. The right panel has some light wear on its bottom edge, otherwise there are only light handling marks. There are no chips or cracks. The grips rate in about Excellent condition. Type of Finish: The bluing is a black-oxide finish. Bore Condition: The bore is bright and the rifling is shallow but sharp. There is no erosion in the bore. Overall Condition: This pistol retains about 95% of its metal finish. The slide has light thinning on the leading edges with a few scattered light marks, a couple of nicks on the right flat and a line of operational wear on the bottom. The frame has only a few scattered light marks. The indented checkering on the mainspring housing shows a few light marks. The hammer knurling is sharp as is the trigger knurling. The screw heads are sharp. The markings are clear and crisp. Overall, this pistol rates in about Fine condition. Mechanics: The action functions correctly. It has both a manual and grip safety and the trigger pull has a small amount of creep. The slide is tight to the frame. We did not fire this pistol. The pistol has a lanyard ring on the bottom of the mainspring housing. Box, Paperwork & Accessories: This pistol comes with one 7 round blued magazine. The magazine has light operational wear, in about Fine condition. Our Assessment: From https://forums.1911forum.com/showthread.php?t=68064: “In 1914, the Argentine military adopted the Colt M1911 as their standard military sidearm and contracted with Colt to supply these guns. Argentina took shipment of 2,151 of these weapons between 1914 and 1919. In 1923, Argentina adopted an armaments bill that would eliminate Argentine dependency on foreign arms. Under this bill, the Argentine Congress authorized appropriations for a military modernization program and prepared the infrastructure for a domestic arms industry. In accordance with the new law, an aircraft factory was established in 1927, a munitions factory in 1933, a small steel mill in 1934, and a small arms factory in 1936, all of which were managed by Argentine army officers. In 1927, the Argentine Commission for Foreign Acquisitions negotiated a contract with Colt for the manufacture of M1911A1 .45 caliber self-loading pistols specially marked and serial numbered in a separate series, and secured a licensing agreement giving the Argentine government the right to manufacture these pistols using drawings, material specifications, instructions, etc. supplied by Colt. The 10,000 pistols were delivered by Colt from 1927 to 1933, and have become known as the Hartford Colts. Production of the Sistema Colts began in 1927, and 14,000 were produced by 1942. In 1945, a new factory (FMAP) was brought on-line and produced another 88,494 pistols through 1966”. The Sistema Colts continued to be used in Argentina until the 1990’s, when they were replaced by Browning High Powers. The Sistema Colts were not Colt clones, but except for finish and markings, they were identical to 1911A1 pistols produced by Colt, and the parts were interchangeable. Top quality steel was used in the construction, and they are known to be as tough and reliable as those made by Colt. This pistol was made at the FMAP factory in 1952 and is marked with the Argentine crest and “Ejercito Argentino”, indicating it was issued to the Army. 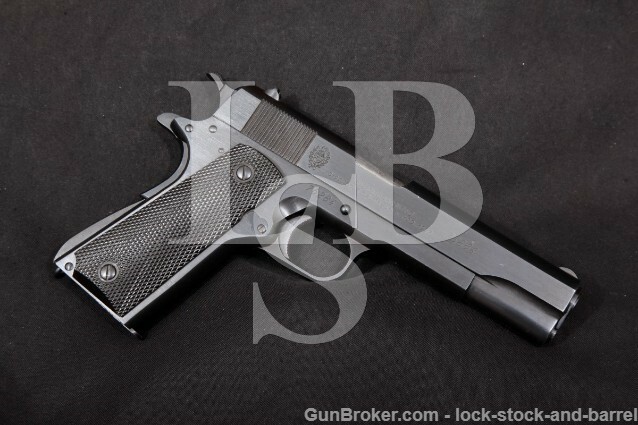 This pistol is in Fine condition with 95% of its original black-oxide finish, matching serial number markings including magazine, and no import mark. The high quality of the Sistema Colts and the relatively few produced make them very collectable, especially ones like this with matching numbers in this condition. Please see our photos and good luck!